My latest studio painting brings together all the experiences I've enjoyed, so far, since last August in my pursuit of the perfect seascape. I've blogged the challenge which began with the Genesis of a seascape in oils and later transitioned into the Evolution of a seascape in oil series. The journey to date has involved taking thousands of photographs and shooting some video footage of the local coastline at various times of day and in differing weather conditions. 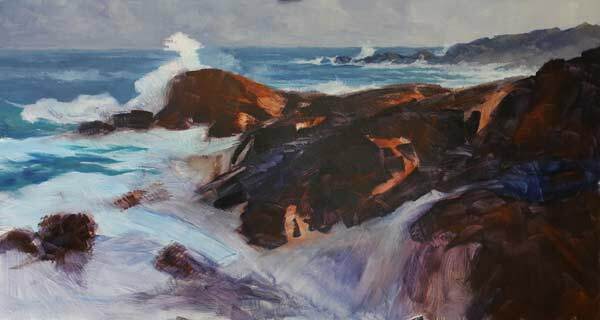 I've also completed dozens of plein air studies of waves and rocky shores and studied seascapes by other artists, both historical and contemporary. My primary focus has been to not just recreate a photograph of the sea, but to capture the energy of the local coastline in paint through the use of a strong abstract foundation. Working from a photographic reference, I used Liquol (an alkyd medium by Art Spectrum) and solvent to reduce the paint and laid in my initial tonal washes. There's some early thought here about warm and cool areas. Starting with the sky, the most distant part of the scene, I began adding body paint. In the foreground, I concentrated on the major shadow masses. Highlights will be added later. Even at this early stage, you might see that I'm employing direction lines. The most obvious lead-in is the dark mass of rock pointing straight to the crashing wave. Highlights will break this mass up a little. I've also incorporated a "Z" shape in the white foam. This path starts at bottom-centre, moves up to the left and then turns right, past the focal point, before heading toward the distant headland where it returns the eye back to the centre of interest. Here's how the painting finished up with highlights and shadow detail added. It captures that moment on a cloudy day when the sun manages to break through and light things up for a moment. 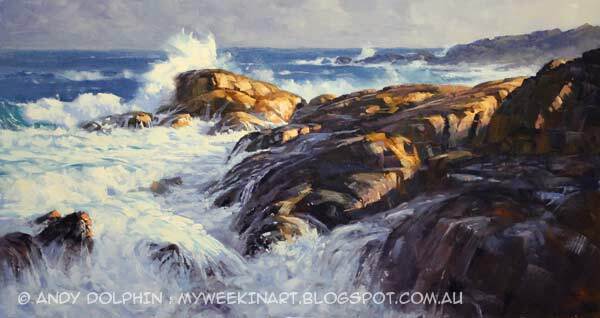 There's a storm brewing in the distance sending a barrage of waves to batter a heavy and unmoving rocky coast. This is when the sea is, to me, at its very best. To increase the energy of the scene, I've dropped the viewpoint somewhat below the level where I actually stood to take the reference photo. I couldn't possibly have stood this far down the rocks and remained dry - or safe - but I wanted to capture the feeling of being there. Lowering the viewpoint in this way requires some reorganising of the elements in order to correct the perspective - but the results are worth the time and effort. 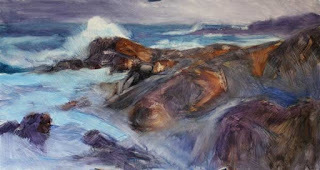 I like this seascape--reminiscent of Roger Curtis (1910-2000). Nice blog, too!